Coca Cola. Yes, Coca Cola. Don’t ask. Of course, we weren’t able to try all of these. Or even more than a couple. Or hardly one, for that matter. Luckily, we had a guest who was more than willing to order–and eat–two of these items. Because of his selfless bravery we were able to experience–vicariously, thank goodness–some of this good badness. (Chocolate-dipped frozen cheesecake on a stick was also available, but since it wasn’t deep-fried, it’s somewhat outside the scope of this discussion (though why it couldn’t have been chocolate-dipped and then deep-fried is beyond me).) 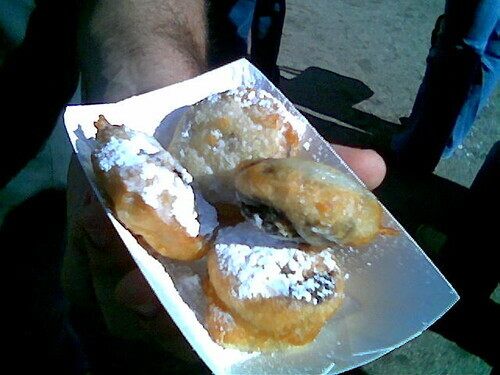 First on the docket were the fried oreos. These came 5 for $5, and were exactly as they appear to be: oreos, dipped in batter, deep fried, and dusted lightly with powdered sugar. Really, the powdered sugar seemed superfluous, but I suppose that if one is going to create something abhorrent to both God and man, one might as well take it all the way. 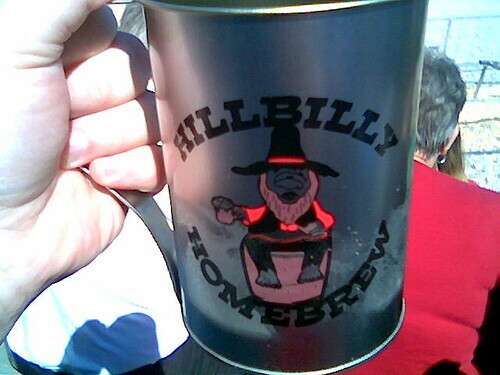 I must admit, I tried these last year at the state fair. I here recount from personal experience the horror that is the fried Oreo. The batter is a pretty typical funnel cake type batter, though less crispy owing to its thicker stature. 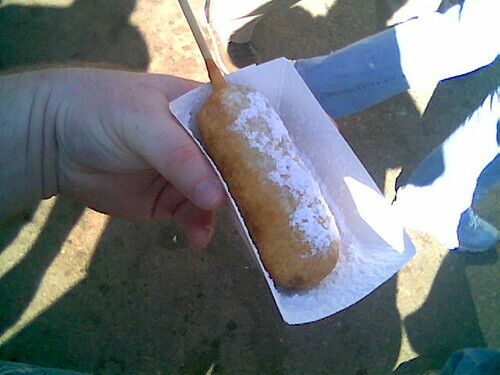 It is grease-saturated, as is all fried fair food, and if one attempts to pick up the Oreo by hand one should make sure to have plenty of napkins on hand. I was uncertain what exactly I was expecting when I bit into the first Oreo–would it be crunchy? Would it taste like an Oreo?–but I was somewhat surprised to find that the Oreo, too, was… while not “soggy,” it was certainly flexible. My teeth met only slightly increased resistance as they passed through the cookie layer. It did, in fact, taste like an Oreo, but the slightly greasy mouthfeel of the Oreo that says “arteriosclerosis” was magnified beyond human comprehension. The deep-fried Oreo was the ultimate expression of hedonistic delight–insanely sweet, guilt-inducingly greasy, disturbingly enjoyable, and utterly revolting all in the same mouthful. Then there was the matter of the deep-fried Snickers bar. I didn’t actually try this, but judging from what I saw I can imagine that it had all the endorphin-releasing, insulin-flooding and stomach-turning capacity of the deep fried Oreos, but this time impaled on a stick and with nougat. As our guest bit into his fryolated chocolate confection, my worst fears were confirmed: the candy bar had softened into a peanut-studded miasma of molten chocolate, caramel and nougat, and the only thing giving the abomination any structure whatsoever was the deep-fried sac that contained it. If it weren’t for the stick providing some kind of foundation to the fried outer layer, the candy bar would most likely have wrested itself free of its golden brown coat and become a gooey, sugary puddle on the back of its consumer’s hand. As for the other items on the menu, I can only quake with fear and imagine the horrors. I’m most curious about the mechanics of the deep-fried cheeseburger–does it have a bun? pickles? mustard and ketchup? 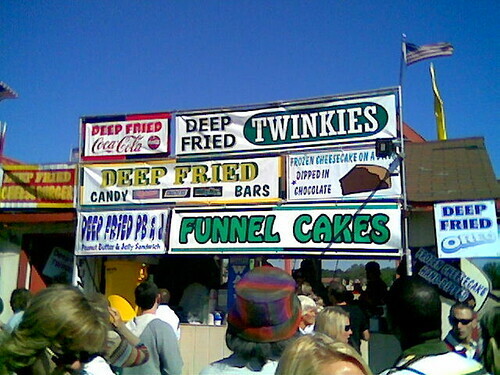 Also–deep fried Coke? Also, it seems that the next trend after “fry everything” is “put hot sauce on everything.” I wonder how that will go on a Snickers…. I watched a friend deep fry snickers bars in a turkey fryer once. A choir of angels was heard singing on high. Please! You must resist the alluring call of the fried! The song you heard was that of harpies tempting you to your doom! 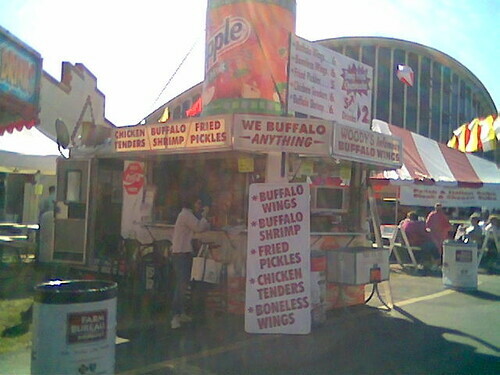 I should really eat at more places that proclaim “WE BUFFALO ANYTHING”. I just don’t eat enough things that have been buffaloed. The truth is, I can’t think of that many things that WOULDN’T be good buffaloed. Would you be willing to let us link to this post from our website, Blue Ribbon memories, at http://statefair.ncdcr.gov? We’re documenting State Fair history, and would love to have this included. By all means! It’d give the blog an air of legitimacy. :) Seriously, though, I’d love to be included!